Othello, at right, played by Chris Butler, reacts to the cunning deceit by Iago, played by Danforth Comins. I love the Oregon Shakespeare Festival. I've been numerous times, and each time I find something new that keeps me coming back for more. This year, I was fortunate to see "Othello" at the Angus Bowmer Theatre, and "Henry V" at the small and intimate Thomas Theatre. Othello's plot is ripe for tragedy. Othello, a Moor, is a highly-ranking military officer who elopes with the daughter of a Venetian. He promotes a young officer to lieutenant instead of his trusted Iago. This sets Iago on a mission to destroy Othello, and others, in the process. Racism and xenophobia are at the forefront of director Bill Rauch's masterpiece. One of my favorite parts about seeing the plays Rauch directs is his ability to modernize the plays and place humor into tragedy. The costumes were a combination of '80s and '90s garb, along with modern Navy uniforms. At one point, while Iago is planting seeds about Othello's wife, Desdemona, having an affair, Othello's cell phone pings. He takes it out of his pocket like a brooding teen, rolls his eyes in disgust, then jams it back into his fatigued pants. Rauch doesn't pull any punches in this play. There are moments that will make you uncomfortable, if you pay attention. Iago's character uses many mentions of Othello's race to sow the seeds of distrust in the officer. Danforth Comins as Iago is worth driving five hours in white-out conditions to see. You can feel his transformation from friend to foe in each scene, building to the end where he realizes his actions have caused more harm than he anticipated. Chris Butler, who plays the lead, is also excellent. His passion for the character is obvious. His final scene—where he realizes his wife was true and takes his own life—will have audiences on the edge of their seats. Desdemona, played by Alejandra Escalante, delivered a hair-raising performance. The rest of the cast was excellent as well. "Othello" runs until Oct. 28. I highly recommend it. I also recommend, if you don't mind staying up until the wee hours of the morning, heading to Martino's for a drink after the play. It's mere steps from the Bowmer and if you play your cards right, the actors will come in to unwind. I got a chance to meet both Danforth Comins and Chris Butler, both as approachable and enjoyable to talk to as they were to watch. 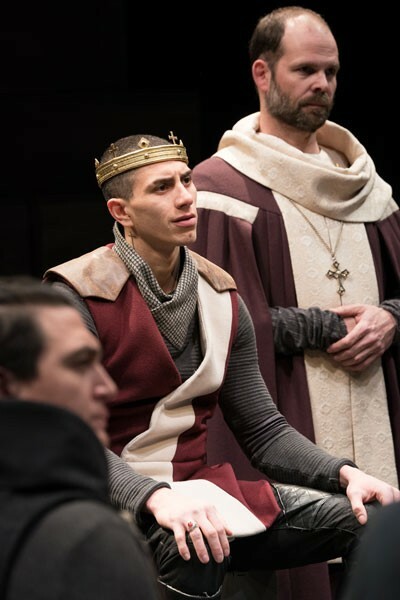 Center, Henry V, played by Daniel Jose Molina, listens to his loyal subjects about going to war with France. Seeing plays at the Thomas Theatre is like watching one at the local grade school, except the actors are some of the best in the world. The actors are so close, you can feel—and see—every emotion they feel. Every actor in the play was so good—changing costumes on the fly, moving large crates in the dark and taking on different personas at the drop of a hat—it's hard to pick out a best actor. That is, until you watch Daniel Jose Molina, as Henry, give his epic speech about the tolls of war. He was so moving that it brought tears to nearly everyone in the audience, and to Molina himself. Not just during his speech, but also when the entire cast gave him, along with the audience, a standing ovation. Rosa Joshi directs "Henry V," and does a masterful job. Her use of symbolism for death and the ability to show the human cost of war by just using red sweatshirts was incredible. This is a complex play, dealing with the king's struggle in weighing whether to take his subjects to war. Can he trust his bishops' claim to lands in France? Does he allow the taunt by the French Dauphin to cause him enough rage to invade a foreign land? King Henry has to decide whether to pardon or kill old friends, lords and prisoners. Even in such a tragic play, playwright William Shakespeare always had time for humor. Near the end, Henry tries to ask the French princess, played by Jessica Ko, to marry him. Only one problem; Katherine doesn't speak English, save for a few words such as elbow and foot, which she finds funny. Henry and Katherine go round and round, with Henry trying to explain his love for the French princess, aided by the random hilarious input by Katherine's lady-in-waiting, played by Michele Mais. In the end, the monarchs wed and France and England are bound. "Henry V" runs until Oct. 27. "Sense and Sensibility," which runs until Oct. 28 in the Bowmer Theater, is Jane Austen's classic adapted by Kate Hamill. Hamill started as an aspiring actress on Broadway, but quickly learned how empty female roles were on the stage. She wrote the adapted play for herself in the role of Marianne Dashwood. The play is funny, sad and ironic. The humorous interplay among the characters is fantastic. The family's patriarchal father passes, leaving the mother and daughters to survive the confusion and disappointment of being unmarried women at a time when success depended on who you married. The cast is a delightful mix of races. If this were a period play, all the actors would be white, but Hamill's version had black, white and little people cast. "Destiny of Desire," written by Karen Zacarias and directed by Jose Luis Valenzuela, runs until July 12 in the Bowmer Theatre. Rodgers and Hammerstein's "Oklahoma!" is in the Bowmer until Oct. 27. Bill Rauch, who is leaving OSF at the end of the season, directs the play. "Manahatta," written by Mary Kathryn Nagle and directed by Laurie Woolery, runs in the Thomas until Oct. 27. This play focuses on Jane Snake, a Lenape woman from the Delaware Nation of Oklahoma. According to the OSF playbill, "Manahatta" explores the meaning of identity, home, the cynical nature of greed and the cost of American capitalism on human lives. So fill up your tank and plan that road trip. It's worth the snowy (or not snowy) drive to Ashland.